As a triathlon coach and a keen athlete, I never shy away from setting goals and training hard to achieve them — indeed, my motto in business and in life is ‘believe to achieve’. 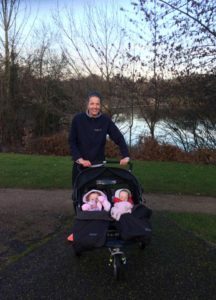 My twins Hannah and Freya were born in November 2015, and once they were past the baby stage I began by looking for a sporting challenge I could take on with them in tow. My husband Ian and I also have a son, Max, who is three this summer, so between our family and our coaching and sports events business, we definitely have our hands full. I therefore began by looking for a goal that would keep me off the sofa, that I could fit in around the rest of my life without too much juggling, that was tough but not unrealistic — and that’s when the idea of breaking a record of some sort came to me, and I started exploring the Guinness World Records website. 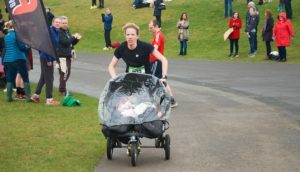 And there was my challenge: breaking the women’s record for running a half-marathon while pushing a double pram. It stood at 1 hour 49 minutes and 23 seconds, and I was confident I could beat that comfortably. I’m 32 and I’ve run several half-marathons over the years, so the distance was never the issue: it was whether I could maintain a fast enough pace while pushing the girls and — just as important — whether the girls would be happy to stay strapped in for more than an hour and a half. 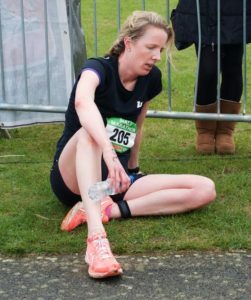 When I started my training plan, I was only just back from several months out of running with a foot injury, so we took it very gently. That first run was just 1.5 miles, and I slowly increased the mileage week by week with a final training run of 11.5 miles two weeks before race day. The girls were generally pretty laid back about their mother’s crazy plan. We had a few issues around too few snacks and not enough layers of clothing on a couple of runs, but we always got back to our home in Bracknell, Berkshire, without serious incident. I found that keeping the girls well stocked with snacks was the key to a trouble-free run, and began giving them an apple each. Nibbling away kept them occupied for ages, as did pouches of pureed food they could manage themselves — but that did mean a lot of cleaning up at the end! I meantime snacked on jelly babies. Before I knew it, I was on final countdown to the race. 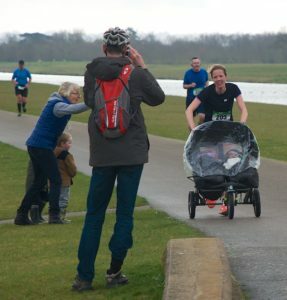 I’d chosen this particular event for a reason: it’s held at Dorney Lake — where the 2012 London Olympics rowing took place — and the four-lap course around the lake is almost completely flat, something that matters a very great deal when you’re pushing a double buggy for 13.1 miles! 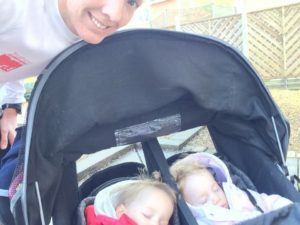 On race day, the girls — by now 16 months old — weighed in at around 20kg between them and the buggy another 13kg, so I was steering a total of 33kg. Running up and over a small bridge four times was the absolute maximum I wanted to do by way of hills on this record attempt. The day had already got off to an inauspicious start because Hannah had been unwell the night before and I wasn’t sure how she would manage. In the event, she slept from beginning to end and Freya was as good as gold sat next to her with a generous supply of snacks. Which was just as well because it was hard going. Really hard going. I put the rain cover over the buggy to protect the girls from the wind, which it did, but it also acted as a sail and made what was already shaping up to be a super-tough race even tougher. 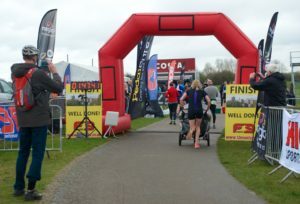 Very quickly it became clear that despite all my hard work in training and a highly realistic projected finishing time that would have taken 10 minutes off the existing world record, I was in grave danger of seeing my bid scuppered by the Dorney wind. It was touch and go, right up until the end, but we crossed the line in a triumphant 1 hour 47 minutes and 33 seconds — and took the world record! It may have been by less than two minutes and much tighter than I’d planned, but a world record is a world record, and I’m very proud to now be in there among all the sporting greats. Am I going to try to better my time? Hmmm… Can I come back to you on that?